MISSION, KS--(Marketwired - Jun 10, 2016) - (Family Features) America is in the midst of an opioid epidemic. Sales of prescription opioids have nearly quadrupled since 1999. According to the Centers for Disease Control and Prevention, in 2012 alone enough opioid prescriptions were written for "every American adult to have their own bottle of pills." Prescription opioids -- medications that reduce pain by interrupting pain signals to the brain -- only mask the sensation of pain, and they come with side effects including depression, overdose and addiction, plus withdrawal symptoms when stopping opioid use. Pain relief doesn't have to come in a bottle, however. Physical therapists can provide a safe, drug-free alternative for treating pain. In March 2016, the CDC released guidelines urging prescribers to rely less on opioids in favor of non-drug alternatives. The guidelines recognize that prescription opioids are appropriate in certain cases, including cancer treatment, palliative care and end-of-life care, but for most long-term pain management non-opioid approaches are recommended. The American Physical Therapy Association, through its national #ChoosePT campaign, is reminding patients that they have the right to choose their method of pain treatment. Physical therapists treat pain through movement and patients get to play an active role in their recovery. The risks of opioid use outweigh the rewards. "Experts agreed that opioids should not be considered first-line or routine therapy for chronic pain," according to the CDC. "Given the substantial evidence gaps on opioids, uncertain benefits of long-term use and potential for serious harm, patient education and discussion before starting opioid therapy are critical so that patient preferences and values can be understood and used to inform clinical decisions." 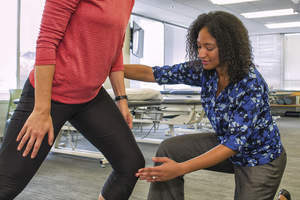 Physical therapists can play a valuable role in the patient education process, including setting realistic expectations for recovery with or without opioids. As the guidelines note, even in cases when evidence on the long-term benefits of non-opioid therapies is limited, "risks are much lower" with non-opioid treatment plans. Pain or function problems are related to low-back pain, hip or knee osteoarthritis or fibromyalgia. The CDC cited "high-quality evidence" supporting exercise as part of a physical therapy treatment plan for those familiar conditions. Opioids are prescribed for pain. Even in situations when opioids are prescribed, the CDC recommends that patients should receive "the lowest effective dosage" and opioids "should be combined" with non-opioid therapies, such as physical therapy. Clinicians should continue opioid therapy only if there is "meaningful improvement in pain and function that outweighs risks to patient safety." Pain lasts 90 days. At this point, the pain is considered "chronic" and the risks for continued opioid use increase. An estimated 116 million Americans are living with chronic pain, but the danger of masking pain with prescription opioids is clear. More than 165,000 people in the United States have died from opioid pain medication-related overdoses since 1999, and every day more than 1,000 people are treated in emergency departments for misusing prescription opioids. If you or a loved one needs help managing pain, talk with your health care provider about safe alternatives to opioids. Additional information on the #ChoosePT campaign, including a pain self-assessment that patients can use to facilitate conversations about their care, is available at MoveForwardPT.com/ChoosePT. 1. Pain is output from the brain. While researchers used to believe that pain originated within the tissues of the body, newer evidence indicates that pain does not exist until the brain determines it does. The brain uses a virtual "road map" to direct an output of pain to tissues that it suspects may be in danger. This process acts as a means of communication between the brain and the tissues of the body to serve as a defense against possible injury or disease. 2. The degree of injury does not always equal the degree of pain. Research has demonstrated that people experience pain in individual ways. While some people experience major injuries with little pain, others experience minor injuries with a lot of pain. 3. Diagnostic imaging (MRIs, X-rays, CT scans) results may not show the cause of pain. A 2015 study in Spine, which analyzed MRI results of more than 1,200 individuals ages 20-70 who had no symptoms of lower-back pain, found that 87.6 percent suffered from bulging discs. Even most subjects in their 20s had bulging discs -- 73.3 percent of males and 78 percent of females, respectively. 4. Psychological factors, such as depression and anxiety, can make pain worse. Pain can be influenced by many different factors, such as psychological conditions. A recent study in the Journal of Pain showed that psychological variables that existed prior to a total knee replacement were related to a patient's experience of long-term pain following the operation. 6. Understanding pain through education may reduce your need for care. A large study conducted on military personnel demonstrated that those who were given a 45-minute educational session about pain sought care for lower-back pain less than their counterparts. 7. The brain can be tricked into developing pain in prosthetic limbs. Studies have shown that the brain can be tricked into developing a "referred" sensation in a limb that has been amputated, causing a feeling of pain that seems to come from the prosthetic limb -- or from the "phantom" limb. The sensation is generated by the association of the brain's perception of what the body is from birth (whole and complete) and what it currently is (post-amputation). 8. The ability to determine left from right may be altered when you experience pain. Networks within the brain that assist you in determining left from right can be affected when you experience severe pain. If you have been experiencing pain and have noticed your sense of direction is a bit off, it may be because the part of the brain that details a path to each part of the body may be impaired. 9. There is no way of knowing whether you have a high pain tolerance or not. While some people claim to have a "high tolerance" for pain, there is no accurate way to measure or compare pain tolerance among individuals. While some tools exist to measure how much force you can resist before experiencing pain, it can't be determined what your pain "feels like."